Robbie kindly invited Alex Adams and me to see his ceramics collection where he lives with his wife Margaret on Kenwood Hill. 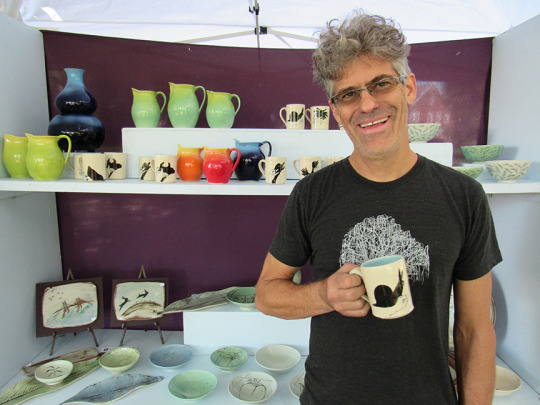 Robbie’s interest in ceramics began when he took a ceramics class in college. What followed was a career in education, along with a 40 year passion for motorcycles. 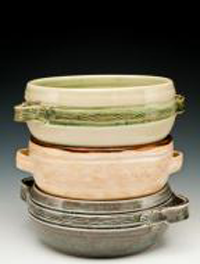 At Margaret’s suggestion to “find a new hobby”, he began collecting turn of the century pottery and eventually relearning the art of ‘throwing’ a pot at AA Clay. 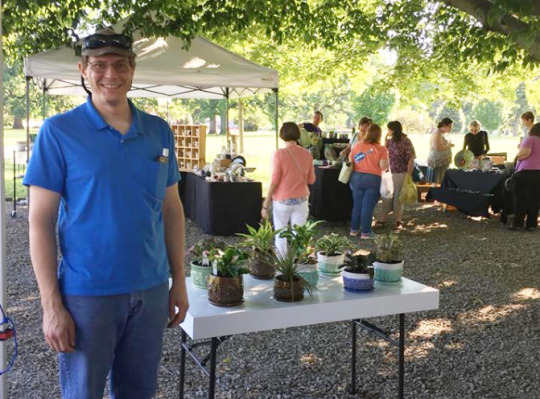 As our tour of the collection began, Robbie enthusiastically presented the book which began his collecting career; Clear as Mud, Early 20th Century Kentucky Art Pottery edited by Warren Payne. 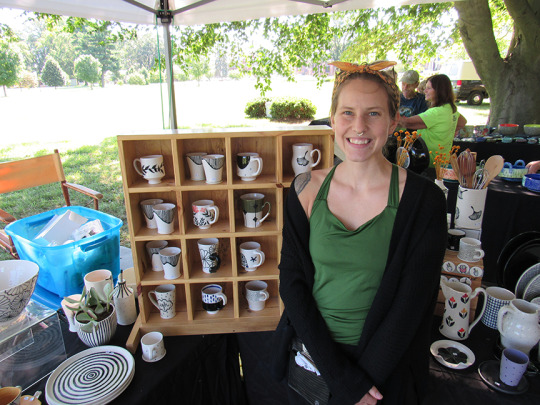 Time spent with Kentucky pottery led Robbie to an interest in the Arts and Crafts movement in England and the U.S. (1880 – 1920). 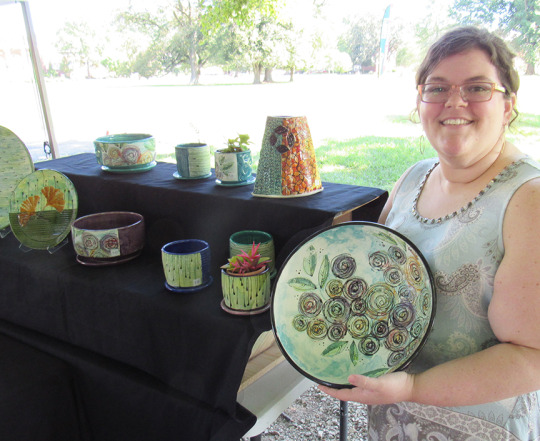 If you are a ceramic artist today, your roots are in the Arts and Crafts movement which espoused the artful, handmade creation of crafts as a needed cultural reaction to industrial production. 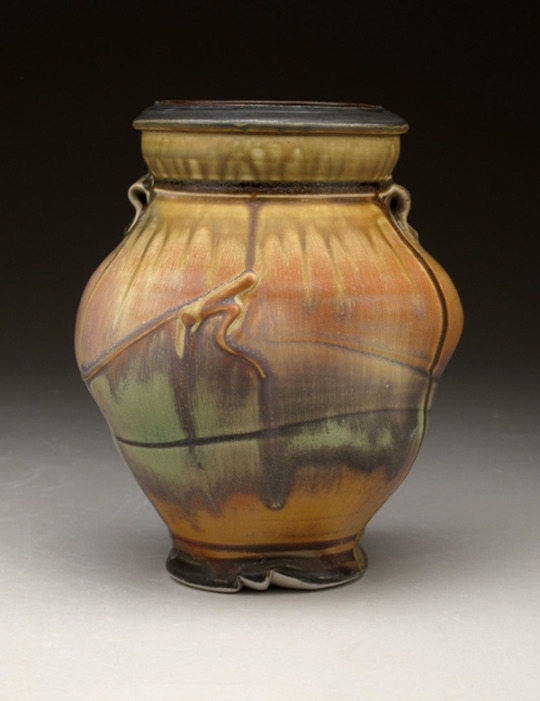 Using the many reference books which give detailed histories of potters, pottery factories and the developing art pottery market of the turn of the century, he began collecting pieces of Clewel, Weller, Roseville, Paul Revere, Fulper, Marblehead, TECO, Clifton, Owen, Hampshire and many others. 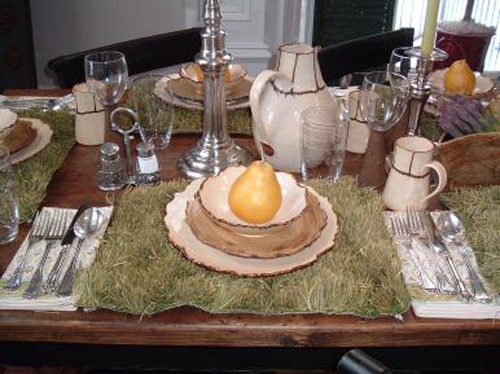 He made his finds at auctions, on ebay, and antique stores throughout his and Margaret’s travels. 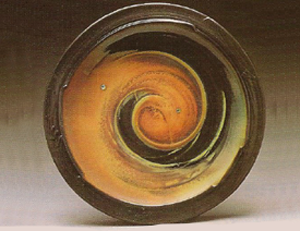 Robbie had realized early on that women were influential in ceramic artistic development throughout the turn of the 20th century. 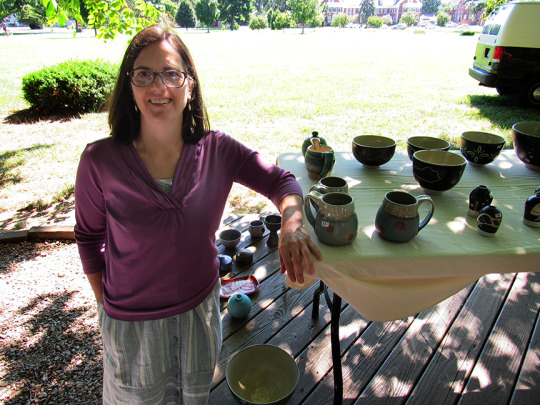 Some women established or managed pottery businesses, while many others were employed as producers of greenware, glaze painters, and designers. 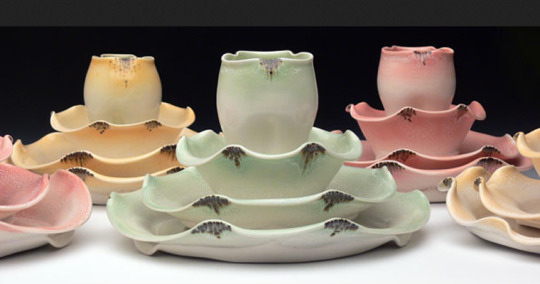 For example, the four Overbeck sisters began Overbeck Pottery in 1911 in Cambridge City, IN. They were known for imaginative figurines, matte glazes, and painted plants and animals. 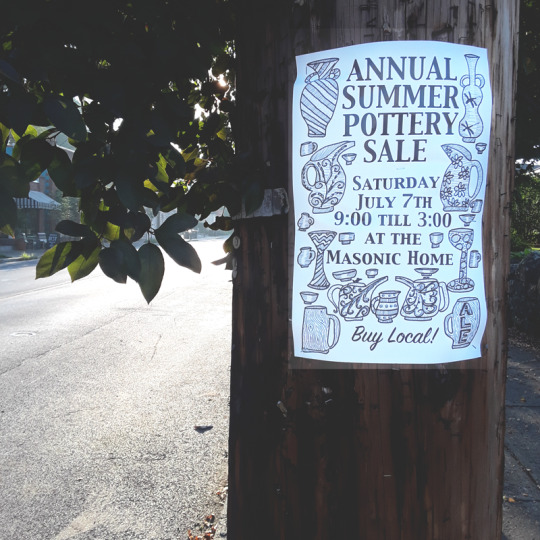 Their pottery business operated until 1955 when the last of the sisters passed away. 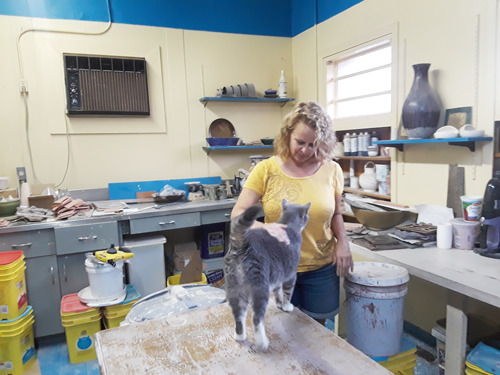 Other female potters of note in Robbie’s collection are Clarice Cliff, Charlotte Rhead, Beatrice Wood, the founders of Rookwood, Mary Chase Stratton of Pewabic Pottery, the women trained at Newcomb Pottery and Polia Pillin. 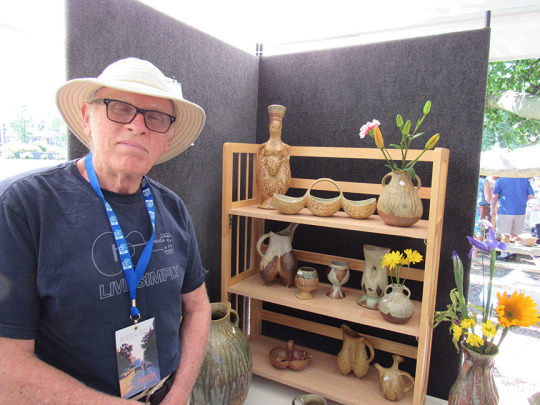 As a finale to our visit, Robbie led us to his North Carolina collection of traditional folk potters who focused on practical shapes and function. 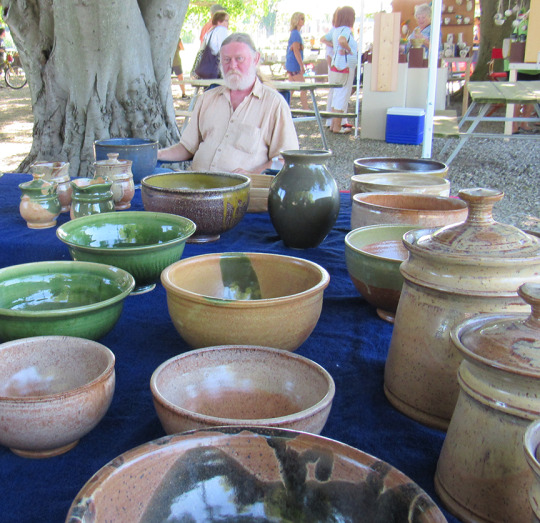 His finds include Jugtown, BB Craig, Pisgah Forrest, pottery of the Owens and Coles and a pot turned by Oscar Louis Bachelder at his Omar Khayyam Pottery in the early 1900’s. Robbie’s philosophy of collecting: “I try to collect one piece from each artist who fascinates me”. 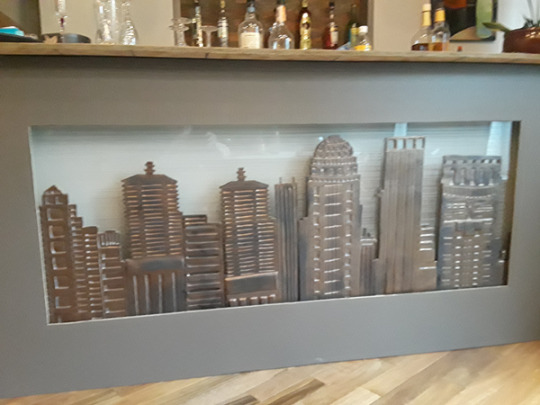 For example, work made at the Grueby Pottery (1897-1920 Boston, MA) is difficult to afford; however, I was happy to buy a small piece of tile that represents everything wonderful about Grueby Pottery. 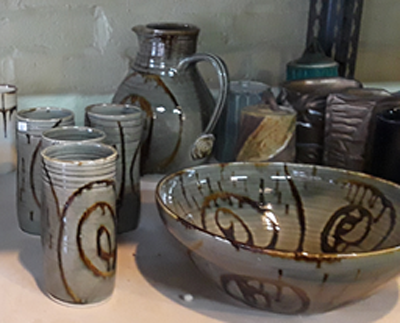 To sum up, the best thing about Robbie Merrick is that he spends many working hours in the studio at AA Clay throwing pots on the wheel and applying glazes. Why does Robbie devote time to learning the craft? 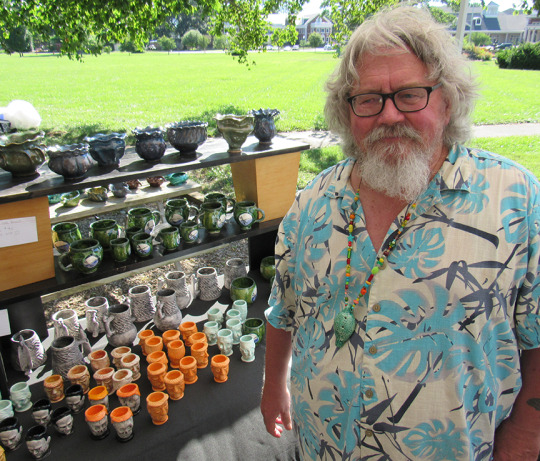 He wisely states that he studies pottery so that: “I can engage in knowledgeable conversations with collectors and potters who know more than I do”. 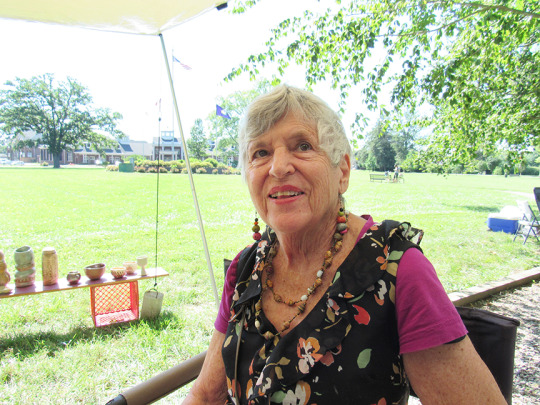 This is a devoted collector. 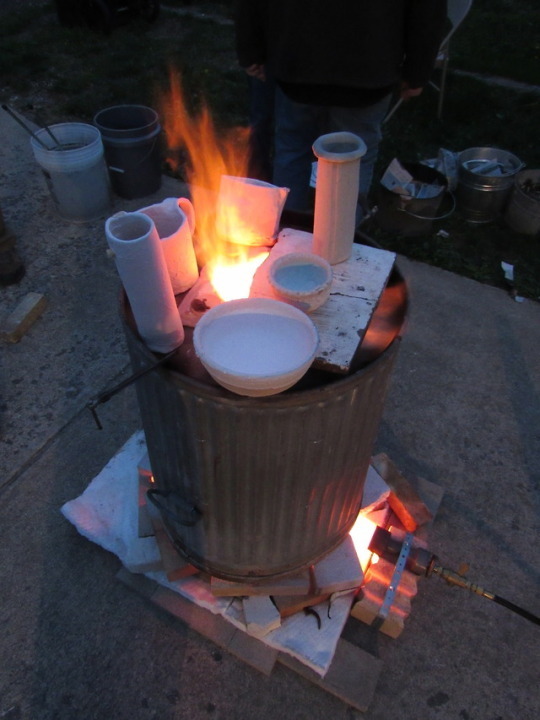 April 14; 5 – 8 pm —— AA Clay Studio and Gallery, 2829 South 4th St, Louisville, will present a rarely seen clay firing process, called raku. The event is free and the public is invited. 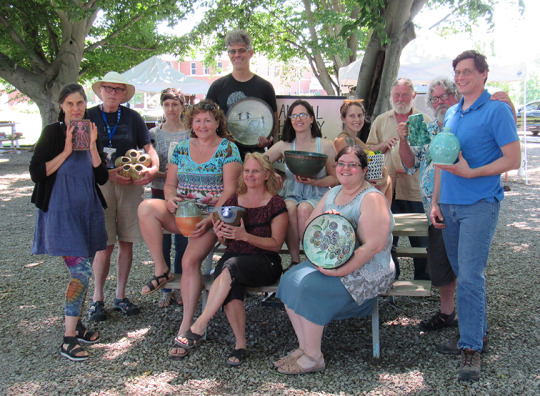 Enjoy watching the artists as they remove their clay objects from the open, roaring hot, outdoor kiln. 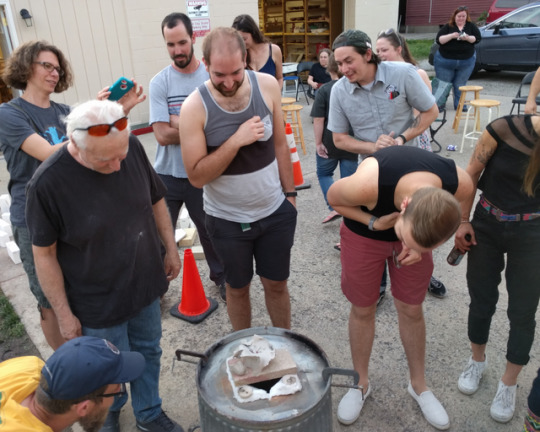 The AA Clay raku workshop raku workshop & kiln firing includes an evening of raku firing on April 21 in which ceramic objects, previously made by workshop participants, are fired in an outdoor kiln. 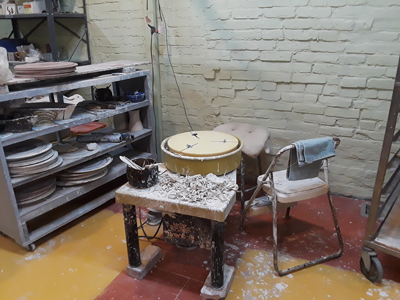 This is an exciting event for artists and viewers alike, as the firing process, from loading the kiln chamber to removing objects from the hot kiln, takes only 45 minutes. After 450 years of feudal conflicts, constant warring came to an end in the late 1500’s. Zen philosophy, the belief that beauty resides in the simple, the quiet, and the imperfect, spread throughout the land. The tea ceremony embodied Zen philosophy. 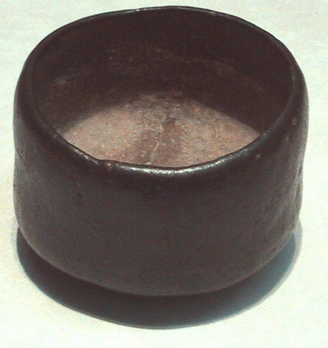 A great tea master, Sen-no-Rikyu, officially promoted the clay works of Chojiro and his wife, who had developed the raku technique of making simple hand-made bowls. 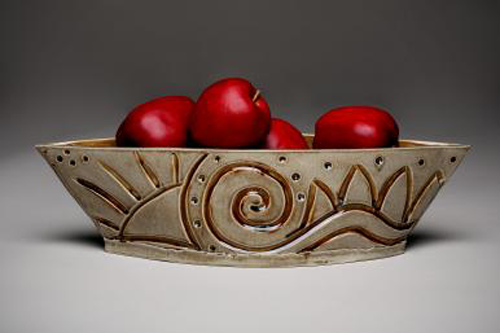 The raku technique of respecting natural processes has continued to influence ceramic art worldwide. As early as 37,900 BCE a human hand was placed on a rock surface in Indonesia and pigment was then blown through a hollow tube (bone or reed) in a diffuse cloud over it, leaving a silhouette image of the hand on the rock. Such images occur in many prehistoric sites all over the world and were created by people of all ages and genders. 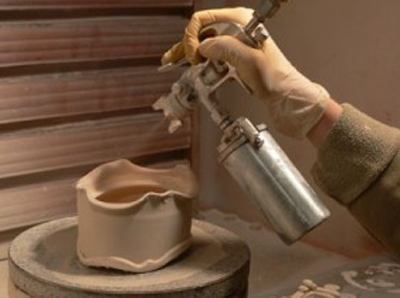 Spraying glazes is currently a popular technique for the surface decoration of ceramic art. 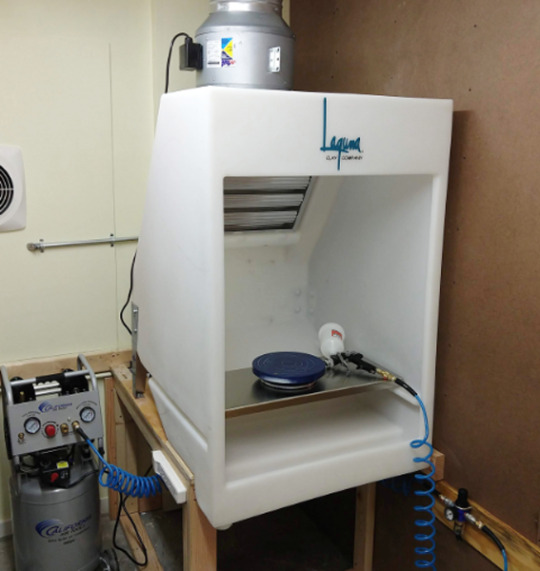 Spraying underglazes, glazes and colorants can be done with a variety of tools including systems comprised of compressors, spray guns and ventilated spray booths. 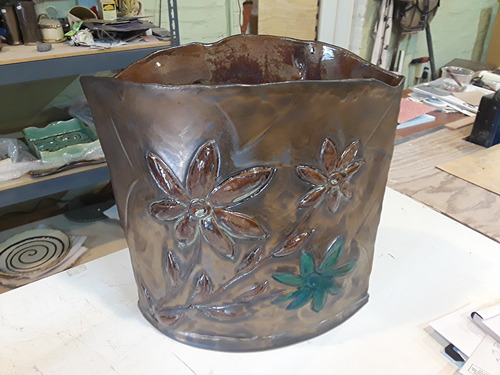 AA Clay Studio and Gallery now offers studio rental of such a system, along with training in the application of sprayed glazes. 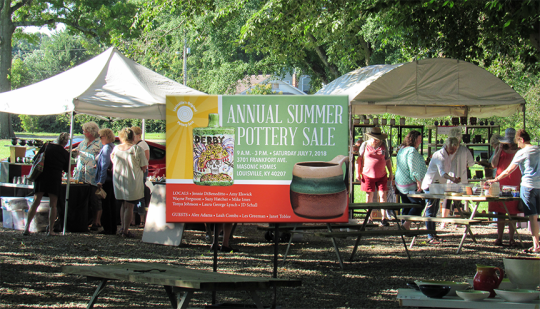 Two contemporary potters, Martha Grover and Stephen Hill, describe their reasons for spraying. 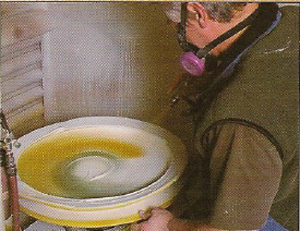 Following are some general tips for spraying glazes. All materials must be finely sieved, preferably through a 100 mesh screen. Keep the gun tip at least 6 inches away from the object. Keep the gun pointed squarely at the work. Spray in long even strokes. Make each stroke separately and release the trigger as you finish each stroke to avoid pile-up. Make several passes over each area, with thickness testing using a needle tool. Wear a properly fitted respirator with a hepa filter. 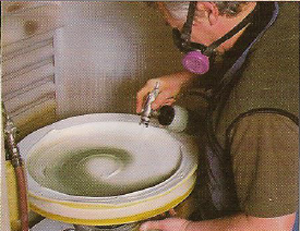 A transparent green is sprayed to emphasize a spiral movement. An iron saturate is sprayed over the green strontium mat to turn it into a Tuscan orange. 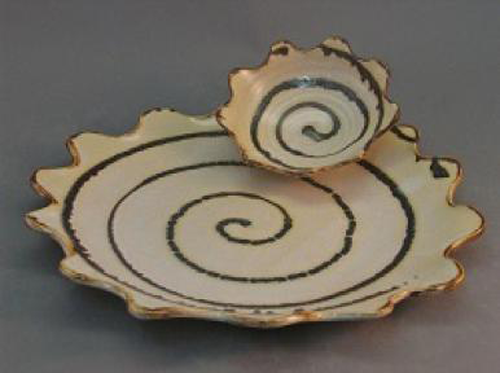 The wide rim is sprayed with a mat black glaze to frame and contrast with the interior of the platter. 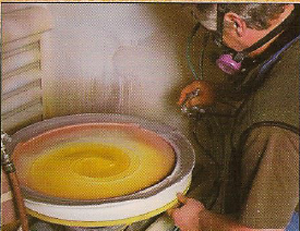 As you see, spraying a glaze is no more complicated than spraying paint. 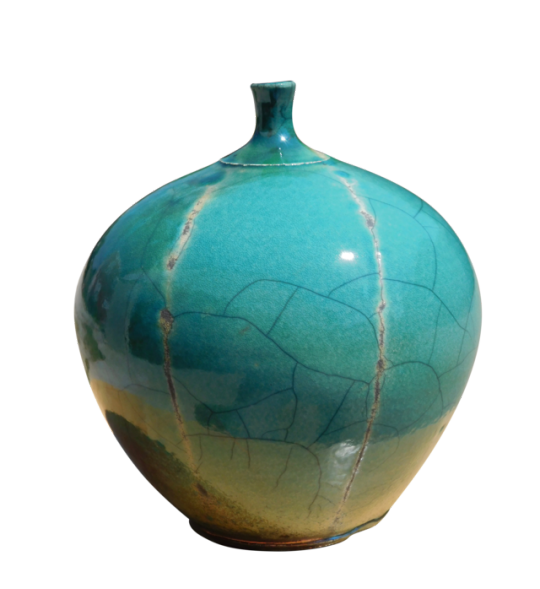 You may need only to cover a sculpture or vessel with an even coat of glaze. 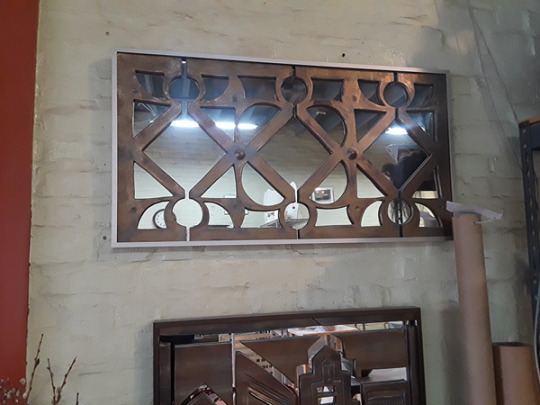 Additionally, this technique has many decorative advantages.